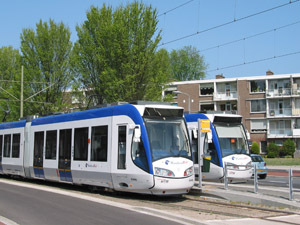 Click here to show full Den Haag tram system! Den Haag (The Hague) has a population of approx. 480,000, with some 975,000 in the metropolitan area. It is situated in the west of Randstad Holland. The Hague is the seat of the national government and home of international institutions like Europol, the Peace Palace, the International Crime Court of the UN, and more than 80 embassies and many multinational companies. 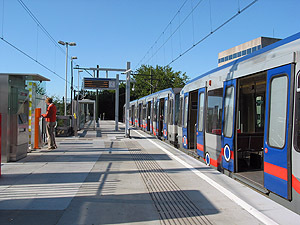 The city has a tram network with a total length of 105 km - click here for more details. On 16 October 2004, a short tram tunnel opened in central Den Haag after several years of delay. 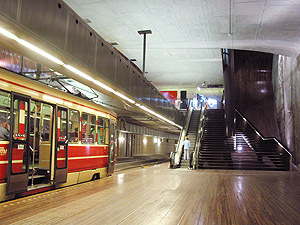 The 1.3 km underground section runs under Grote Marktstraat and includes two underground stations, Grote Markt and Spui, both built together with a large car park. 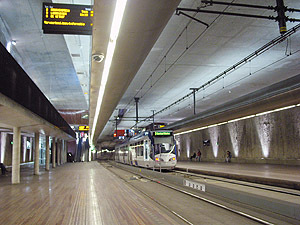 The tram tunnel is used by lines 2, RR3, RR4 and 6. 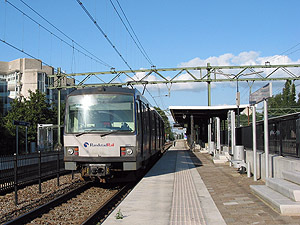 The former NS Hofpleinlijn between Rotterdam and Den Haag that left Rotterdam from the now-closed Hofplein Station was converted from heavy rail to metro operation in 2006. 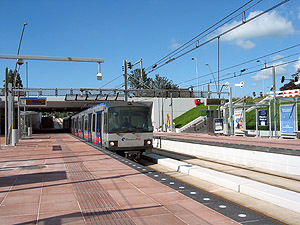 The maximum operation speed is 100 km/h, the power supply on the Hofpleinlijn was changed from 1500 V dc to 750 V dc.In Aug. 2010, the new line was extended underground from Melanchthonweg to Rotterdam Centraal, where it joins the north-south metro line D (formerly known as Erasmuslijn); through service to Slinge was introduced on 11 Dec 2011. 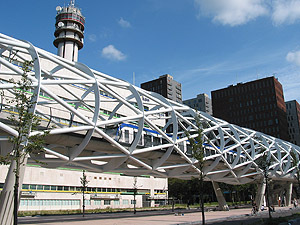 In Den Haag, the trains from Rotterdam terminate on the lower level of the Centraal Station. 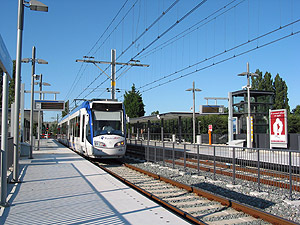 Stations on this line have 100 cm high platforms. On the interurban section of RandstadRail are several level crossings. 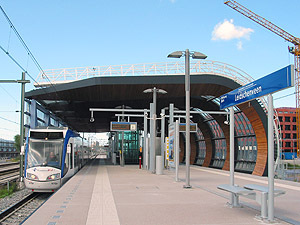 Between Leidschenveen and Laan van Noi, both systems, metro and light rail, share tracks. Platforms at these stations have both 30 cm and 90 cm high sections. 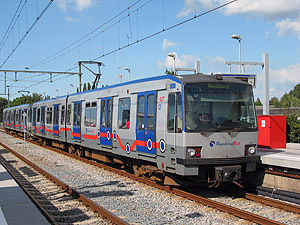 Left: Adapted Rotterdam metro train (class T) on the RandstadRail Erasmuslijn at Rodenrijs station. 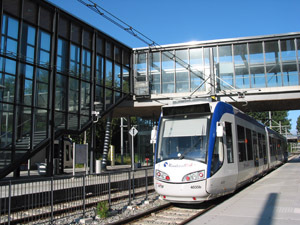 Right: Alstom Regio Citadis at the western terminus of RandstadRail line 3 at Loosduinen. Thanks to David van Keulen and Alain Lemaire!